During negotiations over raising the debt ceiling from July 26th to August 8th, 2011 the S&P500 fell 16%. The index fell only 1% in the first week of negotiations as it looked like President Obama and Republican Majority Leader John Boehner might strike a deal. Then the bottom fell out. In the week of trading since budget talks intensified on Dec. 20th, 2012 the S&P500 has lost 2%. Investors are worried but hopeful that Congress and the President can come to some resolution before tax increases and spending cuts automatically take effect on January 1st. Housing and automobile sales are showing renewed strength; the yearly increase in Christmas shopping was a disappointment but the underlying fundamentals of the economy give reason for cautious optimism. The rapid decline in last year’s stock market should serve as an example to investors in today’s market. For the long term investor, a further decline of 5 – 15% will present some buying opportunities – time to make that IRA contribution or to put some sidelined cash to work. The volatility index, or VIX, measures the relative uncertainty of the broader market using a formula that analyzes the bid -ask spreads of option contracts, which are promises to buy or sell stocks in the future. When the markets are fairly calm, the VIX index is under 18 – 20. As markets melted down in October 2008, the VIX rose to 80. So, 16 is pretty good; 80 is real bad. In the last week of July 2011, this index jumped 20%, then skyrocketed to 48 in the first week of August. This past week, the VIX went up from the calm range of 18 to 23, indicating the underlying worry. Last week I wrote about the debate over which inflation measure to use, the CPI or deflator. If you hear about “chained dollars” or “chained CPI”, it is the deflator that they are referring to. The difference between the two yardsticks is $3 – $5 per month in a $1000 Social Security check. This afternoon, Senate Majority Leader Harry Reid walked away from negotiations over this issue. As I write this in the afternoon of Sunday, Dec. 30th, Senator John McCain has announced that Republican Senators have just taken this issue off of the table. We can expect that the issue will come up again in the coming negotiations over the raising of the debt ceiling. For the past several years, Republicans both in Congress and at the state level have targeted the growth in state and local spending. This campaign of austerity, as Democrats call it, or fiscal common sense, as some Republicans call it, has won Republicans the governerships of thirty states. 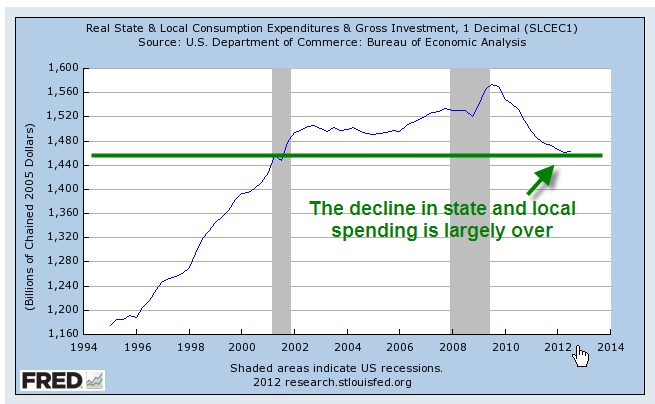 Most of that spending growth has been curbed. 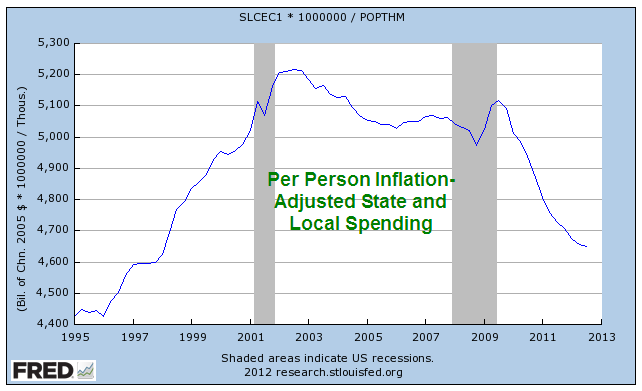 On a per person basis, inflation adjusted spending is at the same level as the mid 1990s. While Republicans dominated the Congress and Presidency in the early 2000s, they showed little concern for the growth in what they call entitlements, programs like Medicare and Social Security. Instead, they increased entitlement programs, adding a Medicare drug benefit program. Since they lost their Congressional dominance in 2006, Republicans have become more cost conscious – and the next targets are entitlements. Most seniors who have paid into Medicare and Social Security all their lives do not consider these programs as “entitlements.” It is a dog whistle word that Republican politicians use to call out to their pack. Democrats look and look and look but simply can not find any cuts that they can make to the social safety net. Under the rubric of compassion, the Democratic strategy consists primarily of buying votes with ever more social welfare programs. In the Democrat view, a government and its citizens are in a partnership. Republicans rightly point out the dangers in any partnership where one partner, the government, holds all the power. Despite all the rhetoric about limited government, Republicans are advocates of a different kind of partnership between government and corporations whose political contributions are essentially kickbacks for contracts with the federal government and a more relaxed regulatory environment. Supposedly vigilant Republicans get out their spending cleavers but can not find any cuts they can make in current defense spending. The operative word here is “current.” The Defense Dept lives in a budget bubble that most of us would envy because it has little economic responsibility for soldiers once they leave the service. Most rehabilitation, medical, housing, retraining and other services that the soldier is entitled to or need are no longer born by the defense department. Congress “dumps” these costs on the Human Services department, routinely targeted by Republicans for spending reductions. In inflation adjusted dollars, we are currently spending 30% more on defense that we spent during the Vietnam War years, 25% more than during the military buildup of the Reagan years. At the beginning of this century, we have two parties whose allegiances prevent them from coming to any meaningful compromise. Tax policy is riddled with temporary tax cuts to promote various social causes. Special interest groups and wealthy taxpayers nibble away at tax legislators, creating a swiss cheese of fairness. Budget planning is a legerdemain practiced by a small coterie of heathens and wizards in budget committees; under current budget rules, there are few reductions in spending, only reductions in projected increases in spending. Imagine that your family budgets for a 3% yearly increase in your utility bills. One year, the utility company has no rate increase. Your family claims that they have cut spending on utilities. The Defense Dept has no long term accountability for the care of their soldiers. The Human Resources Departments have no accountability for increases in health care spending; they are on automatic pilot. Congress has no accountability for passing a budget; they have not done so for six years yet continue to get paid. Bankers risk huge amounts of money that threaten the savings of millions; the company pays a relatively small fine and the individuals responsible suffer no criminal prosecution because of the difficulty and expense of such trials. The public senses that the political party system is morally bankrupt; that the leaders and representatives of this country are unable to break out of the cycle of partisan brinkmanship; that many representatives are bought and paid for; that most of the public has been left out of the deal. The public will either find a way to reclaim their authority over the political process of governing or be left standing helplessly on the sidelines while the two parties scrimmage at midfield, both parties having lost sight of either the goal or the audience. Political advantage has become their goal. Party leaders enforce a rigid heirarchy of committee assignments, rewarding those in the party who comply while shrugging off those who might compromise. Gerrymandered districts ensure that many representatives are accountable only to the more rigid ideologies of their district; their sole challenge comes from extremists in their own party. Maybe this time is different. Maybe not. Slowly and finally, the social, economic and political order cracks; the public votes in the most extreme elements who promise to restore order and principle or their version of fairness. What they bring is despotism. But that could be many years in the future. For now, we salute the New Year!